If you collect antique or Victorian style lamps, you're probably going to need antique glass lamp parts eventually. It can sometimes be a challenge to find these parts. An oil or kerosene type lamp is a handy thing to have around the house, especially if you have a power outage. These rustic looking, old fashioned, antique lamps can illuminate your home for hours, just like they did before electrical lighting was an option. This is just a partial list of the replacement parts you can find for antique lamps. 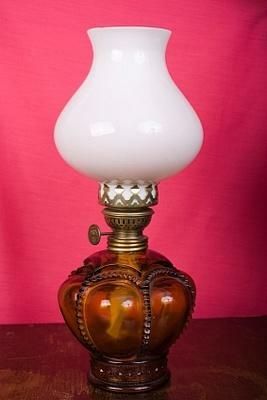 With so many parts available, you should be able to restore just about any kind of antique lamp. The most important thing you need to know in order to correctly choose the right glass lampshade is the proper fitter size of the shade holder on your lamp. The shade holder is the metal part that holds the glass shade on the lamp. The fitter is the part of the glass shade that actually passes through the holder to make physical contact with the lamp. The fitter size must match the size of the shade holder and the lampshade. In order to determine the correct fitter size on your lampshade, you must first figure out what type of shade holder your lamp has. There are typically two types of shade holders for glass lamp shades. The first one is a fixture-type holder, which uses small set screws to hold the shade in place. The screws are necessary to hold the shade tightly in place because the shade is facing downwards and would fall out without the screws. The other type of holder is called a straight-type holder. This type of holder does not require screws because the lampshade is always upright. The fitter or bottom edge of the lampshade rests inside of the shade holders opening. Shades that are designed for fixture-type holders have a lip type fitter and shades designed for a straight-type holder have a straight or lip-less fitter. Once you know the type of holder your lamp has, you need to measure the diameter of the opening of the holder. Fixture-type shade holders and shades typically come in standard sizes such as 2 1/4 inches, 2 ½ inches, 3 1/4 inches, and 4, 5 and 6 inch sizes. Standard sizes for straight-type holders are 1 5/8 inch, 4 inches, 6 1/4 inches, 7,10, 12 and 14 inches. When it comes to choosing the right size replacement shade for an antique glass lamp, just remember to match your lamp's shade holder size and style to the correct lampshade fitter size. If you own an antique Victorian patterned art glass lamp and are looking for high quality glass to restore your lamp with, make sure you visit 19th Century Lighting Supply . This company carries only the best art glass for Victorian parlor table lamps and patterned art glass lamps.